Zofenoprilat is an angiotensin-converting enzyme inhibitor and is the free sulfhydryl active metabolite of zofenopril. Moexipril HCl is a potent orally active non-sulfhydryl angiotensin converting enzyme(ACE) inhibitor, which is used for the treatment of hypertension and congestive heart failure. Zofenopril is an angiotensin-converting enzyme (ACE) inhibitor with an IC50 of 81 μM. Delapril is an angiotensin-converting enzyme (ACE) inhibitor that blocks the conversion of angiotensin I to angiotensin II. Delapril Hydrochloride is the hydrochloride salt of delapril, a lipophilic, non-sulfhydryl angiotensin-converting enzyme (ACE) inhibitor with antihypertensive activity. Captopril disulfide is a metabolite of Captopril. A new antihypertensive agent. Deserpidine is a competitive inhibitor of the angiotensin converting enzyme (ACE). 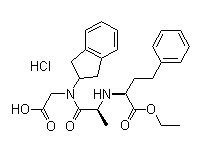 Trandolapril(RU44570) is an ACE inhibitor used to treat high blood pressure. VTP-27999 is an alkyl amine Renin inhibitor; VTP-27999 is useful for Hypertension and End-Organ Diseases.